This all-in-one, portable, affordable studio production system is ideal for a number of markets. 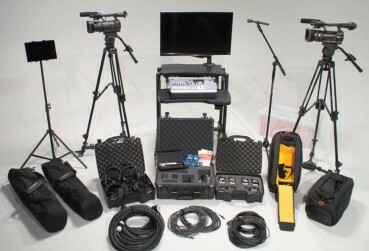 These include education, where classroom lectures, board meetings, and indoor sporting events can be easily captured; business, for training videos, board meetings, and product shots; law enforcement, for interviews, training videos, and evidence documentation; and medical uses, for patient interviews, procedure videos, and doctor round-table discussions. In addition, the system is perfect for faith-based production solutions, such as services, messaging, teaching/training, outreach, and broadcast. Two HXR-NX5 Cameras. Each camera has a zoom lens with 29.5mm (equivalent to 35mm film) plus a 20x high-quality zoom. HD production switcher with integrated audio mixer and Multiviewer (up to 10 windows). The switcher has inputs for HDSDI (x4, HDMI (x3) and DVI-! (x1). 27" LED monitor with HDMI inputs for video monitoring, playback speakers and A/V cart. Our lates Xperia tablet, which can be used for teleprompting, to play back clips that have been stored on the cameras, or to connect to the internet. 120GB solid-state recorder with removable hard drives (2x). All necessary cables and connectors, plus storage bins.